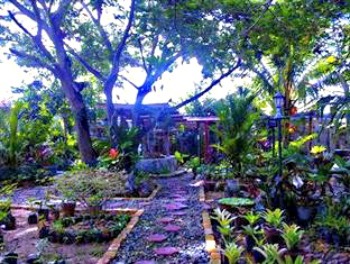 If there is one mysterious and enchanting place in the island province of Guimaras, all hands are up for the Neptune Pittman’s Garden Resort and Spa located in the serene village of Tastasan, Buenavista where exotic plants and trees are taller than life itself. The name of the grand lady owner of the place is Neptune and her parents named her and the other sisters in the name of planets. Married to an American pilot, she collected plants and flowers all over the world and planted these in the family’s 10 hectare property since 2007. Today, the area blossoms with exotic plants and trees including a date tree she collected in Saudi Arabia, exotic red palms as well as the champagne palms and imported flowers. She has friend-connections in Malaysia, Thailand and Indonesia where seedlings were sent to her directly in Guimaras. Aside from her mansion abode, Neptune has several villas and a Japanese style house. She got a sunken flat boat locally known as batel off from the Guimaras strait and made this as roofing of one villa and as a water collector for use of the villas. A big swimming pool adorned a portion of the garden while an ala-fresco restaurant and bar is at the left side adorned by plants, flowers and trees leading to the seminar and training site capable of accommodating 100 persons. Neptune is not only a garden owner as she is the president of the 47-strong members of the Guimaras Hotel, Restaurant and Resort Association. She is also the president of the Philippine Chamber of Commerce and Industry Guimaras chapter who will join Governor Samuel Gumarin in a back-to-back trade and promotions mission in Singapore and Malaysia. The mission of promoting Guimaras and the rest of Western Visayas in the ASEAN is sponsored by the Department of Tourism regional office whose regional director Helen Catalbas is a native of Guimaras and childhood friend and classmate of Neptune. The resort owner admitted being passionate in promoting development of her beloved island province. With tourism as the capital investment in the province, she is positive that Guimaras will find its own place in the highly competitive endeavor as the ASEAN integration looms in 2015. “We have lots to offer to the tourists on top of the sweetest mangoes of the world. We have many natural and man-made attractions which make our island a mysterious and unique place. Come here in Guimaras and let us take care of you,” Neptune invites.